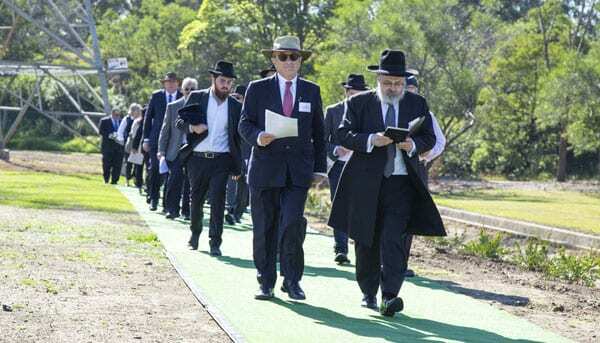 Rabbi Yehoram Ulman lead a group around Lot 27 at Sydney’s Rookwood Cemetery sanctifying a new area ensuring a further eight to ten years of Jewish burials. The consecration will give the Jewish community an additional approximately 1646 graves. It will be the last significant allocation of land to the community at Rookwood and gives the community about four additional years of burial space, or slightly more if double graves become more popular. CEO of The New South Wales Jewish Board of Deputies Vic Alhadeff addressed those attending including Paul Toole, Minister for Lands, Forestry and Racing who also spoke. Alhadeff made mention that Jews were on the First Fleet and have been using Rookwood since its establishment 150 years ago. He said that the amalgamated Rookwood General Reserve Trust “has enjoyed regular, positive and productive cooperation” with the Jewish community and thanked its leaders Jason Masters and George Simpson. The Sydney Beth Din and the Chevra Kadisha were recognised for their co-operation given that the Jewish community does not have any commercial burials. Special thanks were given to David Knoll. Alhadeff said: “Thee tireless efforts of former NSW Jewish Board of Deputies president David Knoll, who has dedicated himself to building relationships with other faith communities and cemetery managers, NSW cemeteries and crematoria, and the State Government. 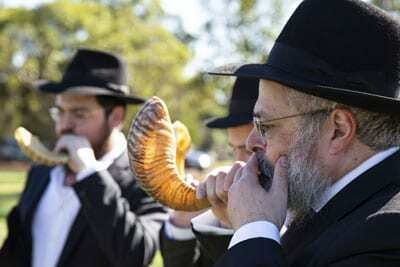 Jewish burial will cease at Rookwood within a decade and availability of land for Jewish burial is fast running out. Alhadeff said that to provide sufficient burial land for the Jewish community for the next century “we have been in active consultation with both the previous and the current NSW governments to try to achieve this vital goal – one which will benefit all faith communities of New South Wales, but in particular those such as the Jewish and Muslim communities which require permanent burial capabilities. He added: “We therefore respectfully urge the NSW Government to significantly accelerate its efforts to attend to this vital need of the people of New South Wales. It will cost money, but not attending to this critical issue will cost even more.